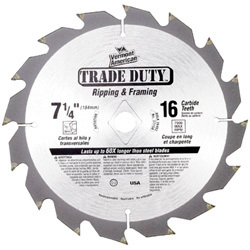 Trade Duty™ series circular saw blades last 60 times longer than standard steel blades. Tungsten carbide tips provide longer blade life and yield smoother cuts. Metal cutting blades are specially designed for cutting non-ferrous metals such as aluminum, copper, brass and lead. May also be used for general trimming in wood.